The Beverlys are sans Genius, and I don’t remember if they ever wrote him out or if he just stopped appearing altogether. Scott and Beau start the match, and just take a guess as to how that goes. Beau takes a powder to regroup with his brother. Back in the ring Blake tags in and Rick does likewise. Blake hits a powerslam, but Rick comes right back with a slam of his own. Scott tags back in. He starts hitting suplexes, but the Beverlys cheat to take control. After a few minutes Rick gets the hot tag and cleans house. Rick hits Steiner-lines on both Beverlys but referee Bill Alfonso is having a hard time keeping control of the match. Scott hits Blake with the Frankensteiner to get the win at 10:46. That was standard formula stuff and a very un-interesting pay-per-view debut for the Steiner Brothers. Michaels has been the champion since 11.14.92. Sensational Sherri is at ringside, as she’s been an integral part of this feud, but they’re not saying whose side she’s on. Jannetty starts off hot, with an answer for everything the champion tries. Michaels takes a powder and he’s able to gain control on the floor. He picks Jannetty up and slams his shoulder directly into the ring post twice. Back in the ring Michaels works over the injured body part, hitting a shoulder-breaker. Michaels continues wearing Jannetty down for several minutes. Jannetty makes a brief comeback but Michaels pitches him back to the floor. Michaels tries to suplex Jannetty back in but Jannetty reverses it and drops Michaels all the way to the floor! That would probably be the first time I ever saw that happen. Sherri appears to be helping Michaels, but instead she slaps him right across the face! That gives Jannetty the advantage, and he seems poised to win the title. Jannetty hits a powerslam and follows up with a DDT but it only gets two! The crowd bought that one. Michaels tries the Superkick but Jannetty ducks it and hits one of his own for another two-count. A series of reversals ends with Jannetty catapulting Michaels into the ring post for a near-fall. The referee gets bumped and Jannetty holds Michaels for Sherri to hit him with her shoe, but Michaels ducks and she hits Jannetty instead! Michaels picks Jannetty up just to hit him with the Superkick to get the pin at 14:20. These two generally had pretty good matches together, and this one was no exception. This was soon after Bigelow’s re-debut with the company, and Boss Man was on his way out the door. Bigelow dominates in the opening minutes, but Boss Man shows his toughness and tenacity by fighting back and taking Bigelow off his feet. Bigelow fights back with a belly-to-back suplex, but then misses a headbutt. Boss Man hits a modified bulldog, but then charges and Bigelow ducks, sending him crashing to the floor. Back in the ring Bigelow pounds away. Bigelow hits a Stun Gun for two. He then puts on a waist-lock for what seems like forever. Boss Man comes back with a sort of suplex, but Bigelow brushes it off and hits a headbutt to the back. Finally, Boss man makes a real comeback and hits Bigelow with a flurry of offense, including the sliding punch. Bigelow catches a charging Boss Man with a boot to the face and then hits a clothesline. He goes up top and hits a diving headbutt to get the pin at 10:09. That was a decent power match but also had a lot of squash tendencies. Bret has been the champion since 10.12.92. In an awesome move, Razor throws his toothpick at the kid Bret gave his sunglasses to. Stu and Helen Hart are at ringside, by the way. Razor controls the first minute or so, and then misses a flying knee in the corner, and Bret goes right after it. Bret focuses on the knee, putting on a Figure-Four Leglock. He continues assaulting the leg until Razor comes back by whipping Bret ribs-first into the steel post. Now Razor focuses on the ribs and back of the champion. Bret comes back and dumps Razor to the floor and follows him out with a suicide dive. Back in the ring the champion brings the fight to the challenger but can’t put him away. Razor fights back and goes for the super belly-to-back suplex, but Hart flips out of it and hits his own suplex. Bret goes up top but jumps right into Razor’s boot. Razor goes for the Razor’s Edge, but Bret slips out and gets a backslide for two. Bret gets a sunset flip from out of nowhere, and then while lying on the mat Bret locks on the Sharpshooter and Razor gives it up at 17:58. Razor hadn’t quite hit his peak yet as a wrestler, but this was a really good showing for him and an all-around solid match. 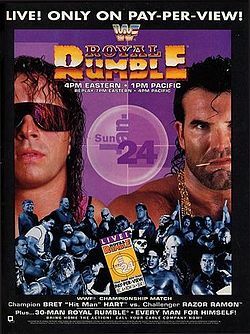 This is the first Rumble where the winner official received a shot at the WWF Championship at WrestleMania. Ric Flair is #1 and Bob Backlund is #2, and that would make the first time that two former WWE Champions begin the Rumble together. Flair and Backlund trade holds and it’s too bad they never got a chance to have a match in WWE at this time, since Flair was on his way out. Monsoon and Heenan put over how old Backlund is, but Flair is older than him by almost six months. Papa Shango is #3, and he’s quickly eliminated by Flair. “Million Dollar Man” Ted DiBiase is #4. He’s one half of the World Tag Team Champions. Flair and DiBiase double-team Backlund. Brian Knobs is #5, and he cleans house on DiBiase and Flair. Virgil is #6 and he goes right after DiBiase. Knobs charges and DiBiase pulls the top rope down to eliminate him. Jerry “The King” Lawler makes his in-ring WWE debut at #7. Max Moon is #8. I think it was Paul Diamond at this point rather than Konnan. Lawler eliminates Moon and Genichiro Tenryu comes out at #9. Like last year, everyone goes after Flair as soon as they hit the ring. That’s especially true of #10, Mr. Perfect, the man Flair will face in a Loser Leaves Town match tomorrow night on Raw. Flair goes right to Perfect’s eyes, but it has almost no effect. The crowd is going ballistic for Perfect. Flair goes to the top rope and gets slammed down. Everything Flair tries Perfect has an answer for. Skinner is #11 and Perfect eliminates Flair. Koko B. Ware comes out at #12. Perfect eliminates Skinner, looking strong so far. Lucky #13 is Samu. Berzerker comes out at #14. Perfect eliminates Lawler and Berzerker tosses Virgil. Lawler then helps DiBiase and Ware eliminate Perfect, majorly deflating the crowd. Undertaker is #15 and he was one of the favorites to win this thing. Berzerker and Backlund fight on the floor while Undertaker eliminates Samu and then Tenryu. Terry Taylor is #16, and he struggles with Koko near the ropes. DiBiase dumps both to the floor, and then turns right into an Undertaker Chokeslam. Undertaker then clotheslines DiBiase out. From out of nowhere, the Giant Gonzalez makes his WWF debut accompanied by Harvey Wippleman. Undertaker tosses Berzerker out, and then comes face to face with this monster of a man in the worst ring gear ever devised. Damian Demento is the official #17, but he’s in no hurry to get to the ring. Gonzalez knocks Undertaker to the floor to eliminate him. That’s not fair. Gonzalez continues the beating as Irwin R. Schyster comes out at #18. Tatanka comes out at #19 to wake the crowd back up. Nasty Boy Jerry Sags is #20. Typhoon joins the fray at #21. Not much happens and Fatu is #22. Earthquake is #23 and he goes right after Typhoon and eliminates him quickly. A “youngster” named Carlos Colon makes his way out at #24. For whatever reason, that’s become a rather famous gaffe for Monsoon, since Colon was 44 at this time, older than both Backlund and Flair. Even so, Colon eliminates Demento. El Matador is #25 as Backlund eliminates Fatu. Rick Martel is next at #26 and he goes right for El Matador. Earthquake dumps Schyster out. The monstrous Yokozuna is #27. The former sumo champion quickly eliminates Tatanka and Colon, and then faces off with Earthquake. Owen Hart is #28. Yokozuna single-handedly eliminates Earthquake. Repo Man comes out at #29. Everyone in the ring tries to eliminate Yokozuna but they can’t. The last entrant, #30, is Randy “Macho Man” Savage. Yokozuna tosses El Matador out. Owen dropkicks Sags to the floor but then gets tossed out by Yokozuna. Savage tosses Repo Man. The final four are Backlund, Martel, Yokozuna, and Savage. Two of them are former WWE Champions. Backlund tosses Martel and the crowd is into him. He then foolishly charges and Yokozuna dumps him out to a chorus of boos. Backlund is awesome. Yokozuna dominates Savage, but the Macho Man won’t give up. Savage avoids a charge in the corner, and he quickly goes up top to hit the Flying Elbow. For some reason he goes for a pin, likely because he was disoriented from the beating he received, and Yokozuna simply presses him all the way to the floor at 66:36. I generally like the Rumble and this was sort of fun, but they squandered what little star power they had by dumping Flair, Perfect and Undertaker so early. They made up for a little with Backlund being awesome and Savage sticking it out to the end, but this isn’t one of the best Rumbles. This is an okay show, with the two title matches and the Rumble at least being enjoyable, and the other two not-so-good matches were only about 10 minutes apiece. This set the stage for a lot of stuff to come, with Giant Gonzalez feuding with Undertaker until August, Yokozuna going after the WWF Championship, solidifying Bret Hart as the Champion, and introducing Bigelow and the Steiners, so there’s some historical significance.